Abdullah Alimi, head of the Yemeni government advisory delegation in Kuwait, warned over “politic of procrastination and waste of time by the Militias delegation, expressing his “fear that the consultations devolve into a mirage. Meanwhile, UN Special Envoy to Yemen, Ismail Ould Cheikh Ahmed, resumed his separate meetings with the delegations of the government and the militias in the peace consultations in Kuwait. "Discussions continued on security and military issues, including the details of military and security committees," Ismail Ould Cheikh Ahmed said in a statement early Wednesday. The UN envoy had tried to push the two sides to release half of all their prisoners before the Muslim fasting month of Ramadan, which began on June 6. The main sticking point in talks remains the form of the government that would oversee a transition back to normality once a peace deal is reached. One of the main obstacles, according to sources, is the rebels attempts to undermine the international legitimacy of President Hadi’s government. On Tuesday, the Envoy halted the submitting a roadmap to resolve the war-torn country's crisis. according to a source close to the Yemeni governmental delegation in the Kuwait talks. The delay is due to “the [Houthi] rebels' intransigent stance which their last statement has revealed and which took negotiations back to square one,” a source said. Both rival delegations - on one side the Iranian-backed Houthi militias, and on the other the internationally recognized government of President Abdrabbu Mansour Hadi - had both received a copy of the roadmap and discussed it with their leaders. On Monday, the UN's envoy Ismail Ould Cheikh Ahmed, met with members from the delegations attending the Kuwait peace talks to discuss security measures. Ahmed was to present a three-point plan to the parties negotiating an end to the war, which began in late March last year and has led to the deaths of thousands. 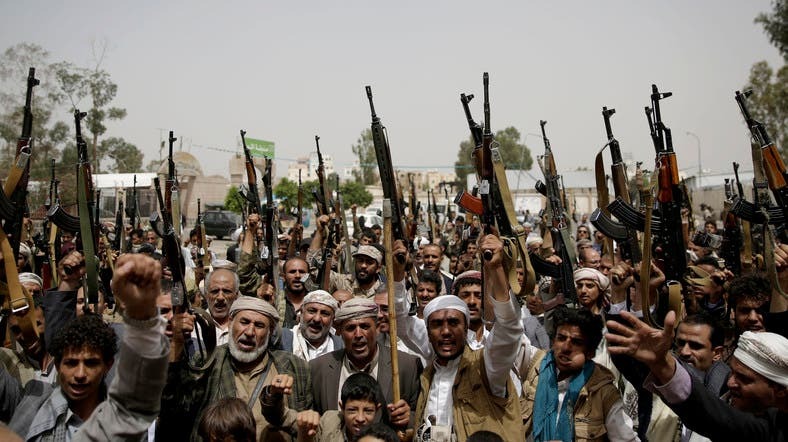 The first component of the proposal will reportedly involve preliminary procedures, most significant of which is the annulment of the “Constitutional Declaration” enacted by the Houthi militias in February 2015, and reverse every subsequent change in state institutions as a result. The second component involves the setting up of an internationally-backed military council consisting of military leaders who have not been involved in the war. It will also include the withdrawal of forces from Area A, which includes the capital Sanaa and the security belt around it, and the return of the government to the capital within two months. According to the terms of the deal, when the Houthi militias withdraw from Sanaa and handing over their weapons, a national unity government will be formed, and it will issue a general amnesty and start a process of reconciliation. The third component foresees a two-year transition period which will see the resumption of a political process.